Often seen from the train or from the M6 motorway as they follow the River Lune where the old counties of Westmorland and Yorkshire use to meet the Howgills are much less visited than the Lake District fells to the west. 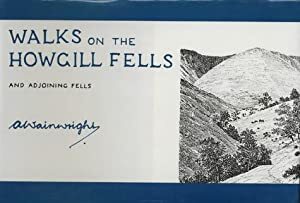 In a slightly different format but keeping much of the typical Wainwright quirky style this little book is a good introduction to what will be an unknown area to many. The Howgills are in a kind of no man's land. Many people living in this area find themselves administratively in Cumbria, with a Lancashire postcode and yet in the Yorkshire Dales National Park. Is there anywhere in the country that can match this for confusion? But get up on the hills or clamber around Cautley Spout (England's highest waterfall - 650 ft.) and all of that matters not one iota. Wainwright includes thirty two walks in this guide.